On Thursday, December 12, 2013, at 9:30am, the doors will open to the annual Performance Racing Industry show, held in Indianapolis, Indiana. As it has since 1986, the racing industry will view the latest in “what’s new” for high performance products. This year, for the first time, industry insiders will see a new Top Fuel motorcycle, with a new Top Fuel motorcycle engine created by Alwine Racing. This combination is slated for drag strip action during the 2014 racing season. 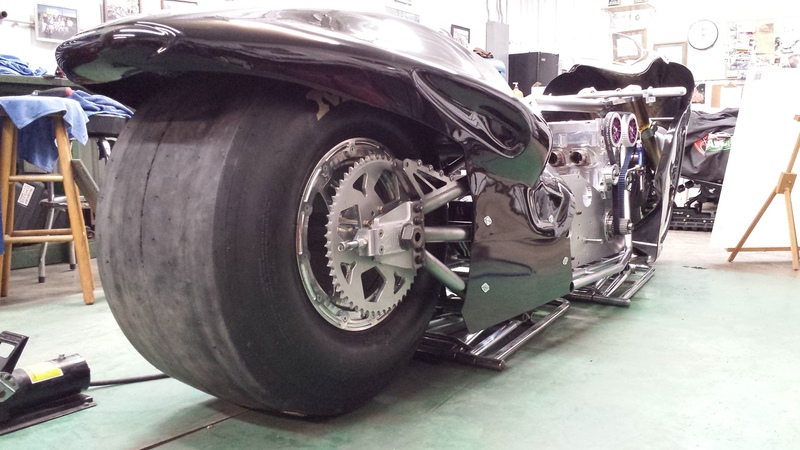 This particular Top Fuel motorcycle is as unique as the motor that resides within it’s frame rails. Both the chassis and the power plant are interestingly developmental in their nature. The chassis, built by Race Visions Reborn of New York, has a 100 inch wheel base, made with heavier wall thickness Chrome Molly tubing than used in previous chassis of this type. It has additional tubing installed it’s lower structure to combat the chassis unloading during deceleration from it’s projected 250 + mph passes down the drag strip. It should be noted here that John Alwine’s tune-ups, on previous Top Fuel bikes, on more than one occasion, have produced top speeds in excess of 250 mph (402 KM/H). Another interesting aspect of this chassis is that the back bone of the bike is not only removable to make engine maintenance easier, but the chassis was made with two interchangeable back bone segments, one for an inline four cylinder motor, the other to accommodate a V-Twin T/F engine. Not only is the design concept of the chassis innovative thinking in it’s nature, but so too is the bodywork. The visual of the bike will fool a lot of people at first glance; it looks like a Suzuki Hayabusa, not a traditional T/F bike. This is a total departure from all other USA based Top Fuel bikes who’s body styling has not followed the shape of factory production motorcycles. 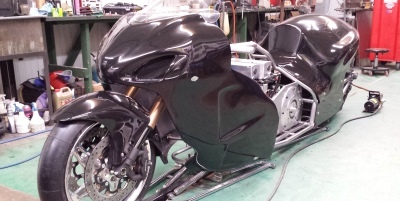 The reason the new Alwine Racing bike has a full frontal fairing with clear wind shield, which is not so much to mimic a factory OEM bike, but to take advantage of the aerodynamics for reasons of high speed stability and also to help deflect wind away from the driver. This body work was made start to finish, in house, by Alwine Racing. More than one Top Fuel motorcycle pilot has been blown off of a machine once air traveling at over 225mph finds it’s way between the motorcycle and the pilot. It just lifts them suddenly off the bike. The new Alwine T/F motorcycle has body work expressly to prevent that from ever happening again. 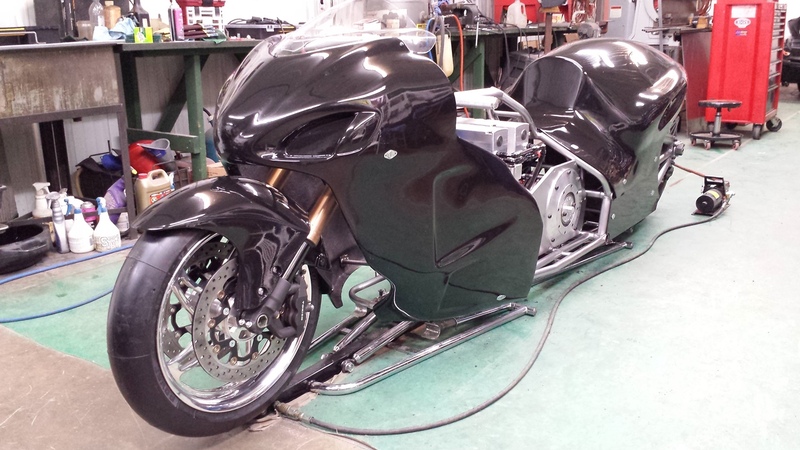 The Alwine team has been approached by several sources concerning wind tunnel testing and if circumstances permit during the 2014 season, the bike may indeed be headed into just such a facility before the end of the season. While the chassis and body have their unique characteristics, their eccentricities are mild compared to what lies beneath the sleek new skin of this motorcycle. Residing within the frame rails of the new bike is a new motor expressly designed and built for Top Fuel motorcycle drag racing: ATF-1. Alwine Top Fuel 1 is an inline four cylinder motor designed by John Alwine that is similar to a Suzuki Hayabusa, but is made for Top Fuel motorcycle drag racing. The crank shaft bearing journal spacing is the same as the famed “Busa” and the cylinder stud spacing is within 1mm of stock OEM Suzuki Hayabusa cylinder stud spacing, per the last rule book produced by AMA/DRAGBIKE for Top Fuel bike specifications. His reasoning is based on knowing that the cost of having multiple engines is so expensive that the very cost alone, keeps some racers from advancing into the class of Top Fuel bike. John’s hope is that, if his motor design works out, it will help keep costs down, therefore more racers will enter the class and this can advance the entire class of Top Fuel motorcycle. The new motor has an 85mm bore to the cylinders and a stroke of 74mm, yielding 1680 cubic centimeters of displacement. The crank shaft for the engine was made to John Alwine’s specifications by Moldex. GRP connecting rods attach to the MTC Engineering pistons that send the work below. The cylinder head designed from conception by Alwine Racing, is a billet aluminum creation from Symonds Machine, of Dowagiac, Michigan. Symonds Machine performed all of the intricate CNC work on the ATF-1 motor. Phil Myers, of Goshen, Indiana, was the very talented CAD/CAM artist responsible for the programming that played a vital role in creating John Alwine’s vision. While many valve configurations were considered in the design of the cylinder head, a conventional two-valve-per-cylinder with a single spark plug for each combustion chamber was implemented for the ATF-1 design which stands for Alwine Top Fuel motor design one. The cam shafts, made to Alwine Racing specifications, are created by Web Cam, and are belt driven from the right side of the motor externally. The left side of the engine block handles the drive line power delivery and the entire lower end assembly rotates on plain bearings. The supercharger is an HPS 2.1 screw type tasked to handle the induction duties. The fuel system and all related components are to Alwine Racing specifications. The latest MTC Engineering Top Fuel clutch will deliver the over 1000 horsepower to the B&J two speed planetary type transmission. The bike is shifted pneumatically from the left hand grip side of the controls. An MSD type 44 magneto will deliver spark and the latest in technology for data gathering will be employed to gather critical information on every pass. As to the critical question, when will the bike be on the race track, the answer is: 2014. The world top speed record holder in the class Top Fuel motorcycle, Korry Hogan, who set the mark on April 10, 2011, while piloting the Hogan, Dryden, Alwine machine at 255 mph, is slated to drive for Alwine Racing. At press time for this story in December of 2013, the ATF-1 bike is better than 80% complete. By spring of 2014, it will come to life for the first time. When it does, testing will begin with much anticipation. John Alwine, Chris Alwine, Dave Alwine, Barb Alwine, Korry Hogan, Dennis Hogan, Laura Hogan and Charlie Bachman. Alwine Racing would like to thank the following list of sponsors and people involved in their historic project: APE Raceparts, MTC Engineering, Brad Penn Racing Oil, Web Camshafts, Symonds Machine, Phil Myers, Schnitz Racing, Portable Shade, Worldwide Bearing, Race Visions Reborn, Van Hook Racing, Al’s Engines, Dale Schmidtendorff, Swiss Valley, Marty Powers, Kurt Alwine and Artie McElwee. 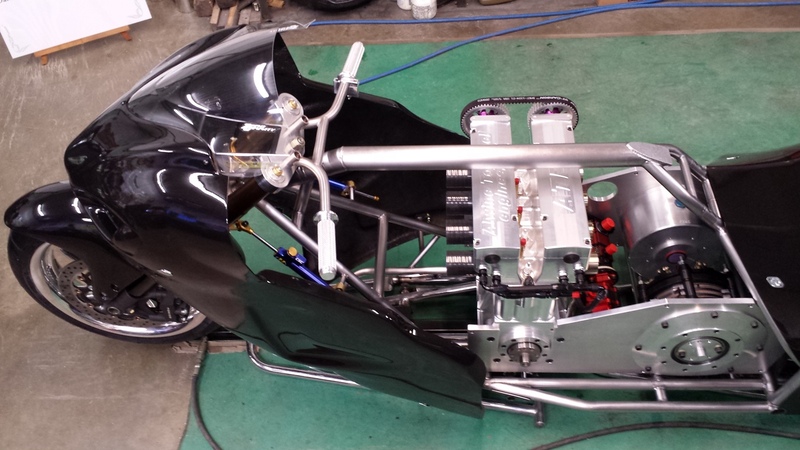 The bodywork and motor are state of the art for 2014! I can’t wait to see what times and mph it will produce. I also expect a 4 valve head to be in the works. I sure wish I could buy this motor and give it a try in my grudge bike! Lol..
We decided that 4 valves would only add problems….The 2 valver will do just fine with boost and a decent nitro load. Keep it simple and make good use of the basics. They already had tons of power left untapped with the old “little” 1500 GS based motor. The new motor is just way easier to service and tune. It is 100% new in every aspect. Nice piece, but I just want to clear up a point made in the article. It is not necessary to have more than one engine to go Top Fuel Bike racing. Any more than one is a luxury, if you have more than one it is, of course, easier to change engines than to take a head off to fix any small issue you may encounter. But be clear it is wholly unnecessary. I am unaware of any team In Europe who has more than one engine, and certainly Brian Johnson only had one when he won the USA TFB Championship, the Svensson’s 5 second machine only has one, and my 5 second team also only have one (and I make them!). Ian I agree more than 1 engine is unnecessary, however I have great memories of watching Russ Collins triple Honda engined top fuel monster at OCIR which was the first in the 7’s and I believe kept that record for many years. The John Hobbs, Henk Vink, Ian Messenger/Derek Chinn and Norman Hyde era was also great to watch. Of course maintenance was unbelievably complicated on these monsters. Your approach to design and engineering cannot be faulted. Has anyone considered using the Puma motor in a four wheel Junior Fueler category? Uh oh, I misread the article. However a spare engine is a luxury for certain. Kudos to the entire Alwine Team and all their sponsors. It’s wonderful to see more engine options become available for TF bike racing. Diversity and choice can only improve the class’ prospects for the future. I’d like to add…where ‘spare” engines are concerned, one man’s luxury may well be another man’s necessity, and I don’t believe one racer can define this distinction for any other racer. I always have a complete spare engine assembly on hand in my racing program. Even though are long stretches of time when all it does is gather dust in the trailer…when I need it the most, it is there, and it has most definitely made the difference between winning and losing not only a race, but also a Championship. As I hardly ever use it, do I in fact “need” this spare? Arguably, as my intention is to win races and points, and as not having it could mean much more time trying to repair our primary unit, and as a result perhaps not making the round call…the answer for me is most definitely “yes”. As for me, I’ve never been one that’s comfortable with delaying a race’s progression just to suit my sudden need to repair my machinery. To me, making the round call is THE necessity, and if I can efficiently swap in an engine,and in doing so not only not delay the race, but also not have my team frazzled and anxious as a result of trying to fix an engine during racing action that we are now delaying…then yes, I most definitely Need that spare engine, and it is not a Luxury by any stretch. snicker,,and the war is getting bigger and bigger as more and more complete motors are made from scratch for nitro racing. When DRAGBIKE! USA (AMA DRAGBIKE!) ran TF as “quick 8” with a run whatcha brought (I cannot bring myself to say “brung”)..it freed up the design aspects. Internal comb ustion engine(s). No thrust. McBoogie.